Individuals carrying BRCA mutations are predisposed to breast cancer. The BRCA1 and BRCA2 proteins are required for homologous recombination and DNA break repair, leading to the suggestion that they act in concert. However, direct evidence of a stable BRCA1/BRCA2 complex has not been demonstrated. Rather, the two proteins have been found as constituents of discrete, but perhaps nonexclusive complexes that are critical for repair. We discuss the interaction of BRCA1 with the BACH1 and BARD1 proteins, and suggest that the pleiotropic nature of mutations in BRCA1 may be associated with defects in protein–protein interactions. In contrast, the role of BRCA2 in DNA repair may be more defined by its direct interaction with the RAD51 recombinase. Almost 5% of individuals with breast cancers are predisposed to the disease by genetic mutations. The discovery of the BRCA1 and BRCA2 genes, and of how mutations in these genes lead to the onset of breast and ovarian cancers has provided new insights into the molecular mechanisms that lead to tumourigenesis and have improved our understanding of cancer predisposition [1,2,3]. In current research the roles of BRCA1 and BRCA2 are beginning to be unravelled, and it is hoped that identification of the precise properties of BRCA1 and BRCA2 will provide an important key to cancer prevention and development of new cancer treatments. Both BRCA1 and BRCA2 are essential genes for cellular development; deletions in either gene lead to embryonic lethality in mice [4,5,6,7,8]. Genetic studies conducted in BRCA1- and BRCA2-defective cell lines [7,9,10] have further revealed that these tumour suppressor genes are required for maintenance of genome integrity and for normal levels of resistance to DNA damage. Moreover, without functional BRCA genes, cells are inefficient in repairing DNA damage by homologous recombination [11,12,13,14], which can lead to apoptosis or cell transformation [15,16]. Early studies on BRCA1 (208 kDa) and BRCA2 (384 kDa) led to the conclusion that the two proteins function together as part of a complex that acts directly in double-strand break (DSB) repair. First, BRCA1- and BRCA2-defective cell lines and knockout mice exhibit similar sensitivities to DNA-damaging agents [4,16]. Second, BRCA1- and BRCA2-defective cell lines show defects in DSB repair by homologous recombination [12,14]. Third, the BRCA1 and BRCA2 proteins co-localize to DNA-damage-induced nuclear foci, and to foci that appear in S phase . Even though BRCA1 and BRCA2 are able to interact with each other, however, only a minority of the BRCA1 was actually found in association with BRCA2 [17,18]. Moreover, the recent identification of proteins that associate with either BRCA1 or BRCA2 indicates that the two BRCA proteins each participate in different protein complexes, and that these complexes may play quite distinct roles in DSB repair. A summary of some of the interactions that have been described for BRCA1 is shown in Fig. 1. In brief, BRCA1 has been shown to be part of a genome surveillance complex termed BASC, which contains a number of proteins that are important for efficient DNA repair (the MRE11/RAD50/NBS1 repair complex, proteins involved in mismatch repair such as the MSH2/MSH6 and PMS2/MLH1 heterodimers, the DNA-damage-signalling protein kinase ATM, BLM helicase and replication factor-C) . Additionally, BRCA1 associates with RNA polymerase II holoenzyme, the cell-cycle-checkpoint kinase ATR, a SWI/SNF chromatin-remodelling complex, the Fanconi's anaemia protein FANCD2, and a number of other important proteins (for review [19,20]). In many cases, however, the specificity and significance of these protein/protein interactions may require further investigation. The interactions of BRCA2 appear more limited, with the most illuminating interaction being that of BRCA2 with the essential homologous recombination/repair protein RAD51 . In the present commentary we focus our attention on a putative DNA helicase termed BACH1, which was recently shown to interact with BRCA1, and on another BRCA1-interacting protein known as BARD1 [22,23,24]. By comparing various aspects of the BRCA1/BARD1/BACH1 complex and the BRCA2/RAD51 complex, we attempt to account for the related repair-defective phenotypes associated with BRCA1 and BRCA2 mutations. The carboxyl-terminal region of BRCA1 contains two BRCT motifs, which are important for protein/protein interactions . Interestingly, many cancer-associated mutations in BRCA1 result in the formation of a truncated BRCA1 protein, in which the carboxyl-terminal region has been deleted. It is therefore possible that proteins that interact with the BRCT motifs of BRCA1 may play important roles in BRCA1-dependent tumour suppression. Recently, Cantor et al. identified a novel 130-kDa polypeptide on the basis of its interaction with the BRCT motifs of BRCA1. Analysis of the sequence revealed that the protein contained the seven motifs that are characteristic of the DEAH helicase family, leading to the name BACH1 (BRCA1-associated carboxyl-terminal helicase). However, intrinsic DNA helicase activity has not yet been demonstrated. The association of BRCA1 with BACH1 was confirmed by three independent methods: GST-BRCA1 fusion proteins were used to affinity purify BACH1 from whole-cell extracts; BRCA1 and BACH1 were co-immunoprecipitated from MCF-7 cells using either anti-BRCT antibodies or anti-BACH1 antibodies; and BRCA1 and BACH1 were shown to co-localize to nuclear foci in S and G2 phase cells by immunofluorescence microscopy. Most importantly, functional BRCA1 was shown to be essential for nuclear focus formation by BACH1, suggesting that BRCA1 plays a role in regulating the cellular localization of BACH1. BRCA1 is potentially involved in transcription, replication and DNA repair, and it is therefore possible that the putative helicase BACH1 could be involved in any of these cellular processes. In order to address the significance of BACH1 in DSB repair, Cantor et al. showed that over-expression of a BACH1 gene carrying a mutation in the sequence encoding the conserved lysine residue (Lys52→Arg) in the ATPase domain greatly decreased the ability of the cells to repair DSBs promptly . Interestingly, this dominant-negative phenotype was rescued by over-expression of BACH1 carrying a second mutation that abolished interactions between the mutant BACH1 and BRCA1. Those findings show that the repair function of BACH1 is mediated through its interactions with BRCA1. It is possible that BRCA1 is required for the specific recruitment of BACH1 to the sites of repair. BACH1 mutations have been identified in two out of 65 women with early-onset breast cancer , one of whom had a familial history of breast and ovarian cancer. Both individuals were normal for BRCA1 and BRCA2. One mutation (Pro47→Ala), in the highly conserved ATP-binding domain, was found to lead to destabilization of BACH1 protein. Clearly, this mutation will result in loss of function of BACH1. The second mutation (Met299→Ile) is a conservative substitution in a nonconserved residue, and its functional significance is unclear. Unfortunately, the correlation of these mutations with DSB repair efficiency and genomic instability was not determined. Another protein that is known to interact with the BRCA1/BACH1 complex is BARD1 . First isolated in a two-hybrid screen for BRCA1-interacting proteins, both BARD1 and BRCA1 contain a conserved RING finger motif, which is often linked to either DNA binding or ubiquitination . The RING finger motif of BRCA1 has been shown to possess ubiquitin ligase activity, which is greatly stimulated by binding to BARD1 [23,26]. Significantly, a breast-cancer-associated BRCA1 mutation within the RING finger motif abolished the ubiquitin ligase activity of BRCA1, indicating that this activity is important for the action of BRCA1 in tumour suppression . Moreover, several mutations located in the RING finger motif of BRCA1, which disrupt the ubiquitin ligase activity, have also been shown to cause increased sensitivity to DNA-damaging agents. This correlation suggests an additional role for BRCA1 in repair of DNA damage, in addition to its role as a regulator for BACH1, in targeting protein(s) for degradation. Interestingly, BRCA1 also interacts with BAP1, a ubiquitin hydrolase . Because BAP1 and BARD1 can modulate ubiquitination by BRCA1, and both bind the RING motif of BRCA1, there appears to be an intriguing interplay between these proteins in terms of the promotion (BARD1) or prevention (BAP1) of ubiquitin-mediated protein degradation. A likely target for the ubiquitin ligase activity of BRCA1 is the Fanconi anaemia protein FANCD2, which is known to be mono-ubiquitinated in a BRCA1-dependent manner in response to DNA damage . Consistent with this proposal, FANCD2 co-localizes with BRCA1 in DNA-damage-induced nuclear foci, FANCD2 and BRCA1 can be co-immunoprecipitated together, and mutations in FANCD2 result in hypersensitivity to various DNA-damaging agents . Because BRCA1 interacts with a wide range of proteins, it is likely that the protein plays a multifunctional role in DNA metabolism. Two such roles may be defined by its interactions with BACH1 and with BARD1, both of which impact on the efficiency of DNA repair (Fig. 2). These functions may also require phosphorylation of BRCA1 by the protein kinase ATM in response to DNA damage . What, then, are the precise functions of the BRCA1/BACH1/BARD1 complex in relation to recombinational repair? It is interesting that several of the proteins that interact with BRCA1 exhibit helicase/nuclease activities (e.g. the BACH1, BLM, MRE11/RAD50/NBS1 complex) and it is possible that BRCA1 may assist the targeting of these proteins to DSBs, where they play a role in break resection. Alternatively, proteins that interact with BRCA1 may be involved in the processing of recombination intermediates that contain Holliday junctions. Support for these potential roles comes from observations indicating that BRCA1 binds DNA and inhibits the exonuclease activities of the MRE11/RAD50/NBS1 complex, and that it also displays a preference for branched DNA structures . The ubiquitin ligase activity of the BRCA1/BACH1/BARD1 complex might be important for down-regulating proteins that are involved in cell/cycle progression during the initial step of DNA repair, or DNA recombination proteins after the repair process is completed. Distinct complexes formed by BRCA1 and BRCA2 are involved in a variety of cellular processes such as damage signalling, protein degradation and both direct and indirect effects on the mechanisms of homologous recombination and DNA repair. Defects in these processes can lead to inefficient repair of DNA damage, genomic instability and tumourigenesis. Like cells that are defective in BRCA1, BRCA2-defective cells are also defective in homologous recombination , leading to the repair of DSBs by alternative mechanisms that involve nonhomologous end joining (NHEJ) [9,30]. The consequences of NHEJ can be disastrous for the cell because, unlike the conservative process of homologous recombination, NHEJ can occur between breaks on different chromosomes, resulting in chromosomal translocations or deletions. Such changes can lead to improper regulation of gene expression that could, in turn, result in cell transformation and cancer development. BRCA2 protein interacts directly with the RAD51 protein, the cellular recombinase that is essential for the initiation of DNA/DNA interactions that lead to strand exchange . The ease with which these two proteins can be co-immunoprecipitated from cell-free extracts  indicates that BRCA2 may play a more direct role in DNA repair than BRCA1 (Fig. 2). RAD51 interacts with BRCA2 by binding to a series of BRC repeats that are present in BRCA2 [21,32]. In recent in vitro studies , it was shown that peptides that correspond to the BRC3 or BRC4 repeats of BRCA2 bind RAD51 and block its ability to form nucleoprotein filaments on DNA. This observation helps to explain the results of earlier studies conducted by Chen et al. , in which it was shown that over-expression of the BRC4 repeat in mammalian cells resulted in a hypersensitivity to DNA-damaging agents. Presumably, high levels of the BRC4 repeat competed with BRCA2 for RAD51, resulting in a dominant-negative phenotype. Because DNA binding and nucleoprotein filament formation by RAD51 is required for all recombination activities exhibited by the protein, those observations indicate that BRCA2 plays an important regulatory role with respect to RAD51. Those studies also showed that mutations within the BRC region that mimic cancer-associated BRCA2 mutations failed to inhibit DNA binding by RAD51. As part of the cellular response to DNA damage, RAD51 and BRCA2 co-localize to damage-induced foci, which are believed to represent sites where DSB repair takes place [17,35]. Therefore, it is possible that the RAD51/BRCA2 interaction prevents the constitutive binding of RAD51 to undamaged DNA, and that the RAD51 bound by BRCA2 will be reserved for immediate localization to sites of DNA damage. If this is the case, then there has to be a change in the RAD51/BRCA2 interaction in response to DNA damage that allows RAD51 to bind DNA and initiate the formation of nucleoprotein filaments at the sites of DSBs. Such a change might involve DNA-damage-induced phosphorylation of either BRCA2 or RAD51. Mutations that affect the ability of BRCA2 to interact with RAD51, or cause defects in the relocalization of the BRCA2/RAD51 complex, would be expected to have severe effects on the normal efficiency of homologous recombination, potentially leading to gross chromosomal rearrangements and cell death. Although RAD51 co-localizes with both BRCA1 and BRCA2 in S-phase nuclei and in cells treated with DNA-damaging agents, it is important to bear in mind that the majority of BRCA1 does not physically associate with BRCA2 and RAD51 [17,18]. Similarly, there appears to be a pool of RAD51 that fails to form complexes with BRCA2. Indeed, to our knowledge, a 'protein complex' that contains BRCA1, BRCA2 and RAD51 has yet to be isolated. Moreover, it should be emphasized that most of the proteins that have been shown to interact with BRCA1 fail to associate with BRCA2, and vice versa (Fig. 1). Such exclusivity supports the argument that these two tumour suppressors form distinct complexes in vivo, although it is also likely that these complexes may interact in terms of their repair functions. The co-localization of these proteins in nuclear foci only suggests that these two complexes are localized to potential repair sites; it does not necessarily mean that the three proteins interact directly and act in concert. 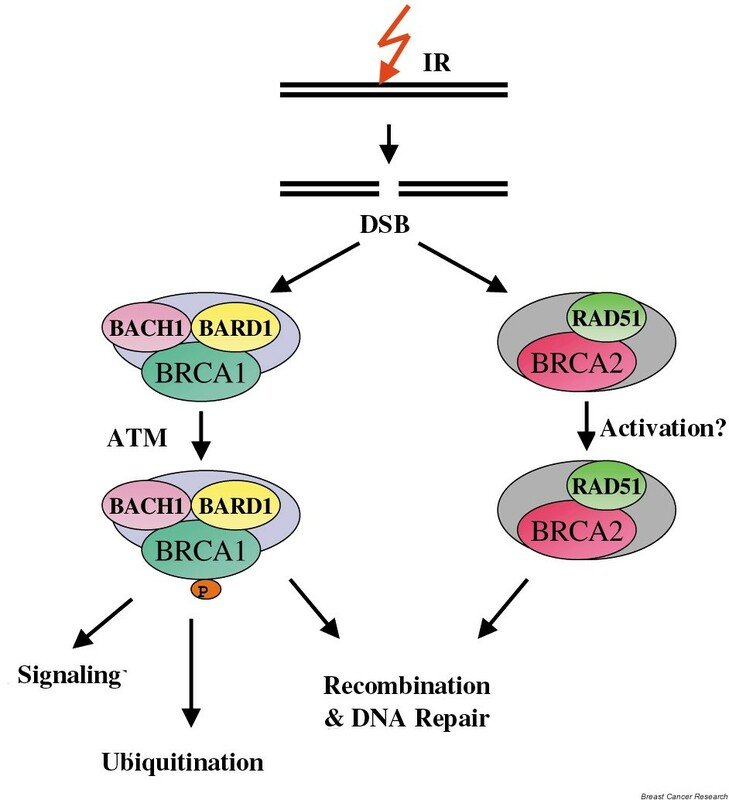 In summary, we suggest that BRCA1 and BRCA2 are capable of playing quite different roles, although it is undoubtedly also possible that complexes containing BRCA1 and BRCA2 may interact transiently to effect key reactions in DSB repair. It is hoped that further dissection of the functions of the novel partner proteins, present in complexes either with BRCA1 or BRCA2, will help to define the precise roles of BRCA1 and BRCA2 in DSB repair. Until then, the proposal that these important proteins influence the same or different steps of the DSB repair pathway will remain open to discussion and insightful experimentation. Work in the laboratory of SCW is supported by the Imperial Cancer Research Fund. YL is a recipient of a postdoctoral fellowship from the American Cancer Society.